Some items are more sensitive to fluctuations in temperature than others. Whether you want to store irreplaceable family heirlooms or important business records, temperature controlled self storage can protect your precious belongings from potentially harmful temperature fluctuations. With our 24 hour storage unit access, you never have to worry about your items being too far out of reach. Is a Temperature Controlled Self Storage Unit Right for You? Temperature controlled storage is the perfect choice for safely storing items that can be affected by natural changes in temperature. Access Storage Now customers commonly use our temperature-controlled storage units for items like the ones shown here. Ferdinand South – E. 1st St.
Keep in mind that some items may require a higher level of temperature control that exceeds the capabilities of even the best temperature controlled self storage units. 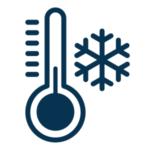 If you still aren’t sure whether temperature controlled storage is right for you, call or visit a self storage facility near you for assistance.